Pope Benedict spoke about the Divine Mercy today in his Regina Caeli homily. He said that it is "the merciful love of God that firmly unites the Church, today as yesterday, and makes humanity a single family; the divine love, which through Jesus crucified and risen forgives our sins and renews us from within." The Pope thanked people for remembering him on his birthday (April 16) and the anniversary of his election as pope (April 19). Full translations are available at Zenit and Papa Ratzinger Forum. The original Italian text with greetings in several languages can be found at the Vatican Press Office's Daily Bulletin. Articles have been published by Asia News and the Associated Press. After the prayer, the Pope followed the perspective of most European countries in supporting the upcoming U.N. Durban Review Conference. That conference is a follow-up to the 2001 UN World Conference against Racism, Racial Discrimination, Xenophobia, and Related Intolerance (WCAR). The first WCAR in 2001 had an anti-Israeli agenda, driven by Iran, with a final draft of a declaration labeling Zionism as racist. The 2009 final draft of the declaration has removed all anti-Israeli references and all references to the Middle East. The U.S. still opposes the WCAR because the new draft of the declaration contains a clause stating that "any advocacy of national, racial or religious hatred that constitutes incitement to discrimination, hostility or violence shall be prohibited by law" The final draft WCAR statement can be downloaded from the U.N. website. The U.S. State Department website has the U.S. Statement opposing that document. The U.S. Constitution protection on free speech prevents laws that curtail inflammatory speech unless it incites imminent lawless action (such as rioting) and is actually likely to produce such action. (Brandenburg v Ohio, 395 U.S. 444 (1969)). Mere advocacy is constitutionally protected in the U.S.
International human rights groups have expressed dismay that a statement in opposition to religious hate speech would be allowed to derail a conference on racism. See BBC article, NGO Monitor, Human Rights Watch, Inter Press Service. The Pope's words were in opposition to racism, and not in favor of a legal prohibition on hate speech. See the Associated Press article. He did not mention the boycott of the event by the U.S. and several other western countries. Canada, Australia, the Netherlands, and Israel presently join the U.S. in its refusal to attend the conference. In his reflection at today's midday Angelus, the Pope said that Jesus' words in today's Gospel reading (Matt. 16:13-20) are addressed to us as Christians and, at the same time, to all of humanity. The mission of St. Peter and his successors, he said, is serve the unity of the one Church with a diversity of cultures, "to make present among all men - marked by innumerable divisions and differences - the peace of God and the renewing power of his love." "Therefore, I ask you, dear brothers and sisters, to sustain me with your prayers, in order that, faithful to Christ, we may together announce and bear witness to his presence in our time." After the Angelus, he spoke specifically of current international tensions and the need to avoid a return to "nationalistic counter-positions," an apparent reference to the risk of return to the Cold War of the past. Full translations are available from Teresa Benedetta at Papa Ratzinger Forum and from Joseph G. Trabbic at Zenit. An article is available at Asia News. Rocky Mountain News has a special report titled "Final Salute." It is drawn from the work by its Pulitzer Prize winning journalist, Jim Sheeler, who spent two years following Marine Corps Major Steve Beck as Beck worked with the families of Marines who died. Sheeler's work is also the subject of a book published May 1 of this year, also titled Final Salute . The Rocky Mountain News page includes a slide show of touching photos, a video, and a 24-page newspaper story about Sheeler's time spent helping the family of a young Marine who died in Iraq. "People think that after the funeral, we're finished," Beck said. "It's not over. It's not over at all. We have to keep taking care of the families." Three recent addresses highlight the Vatican's concerns in world affairs, rooted in human rights and a Catholic view of history. The addresses particularly highlight the 60th anniversary of the United Nation's Universal Declaration of Human Rights. Yesterday, Pope Benedict XVI's Address to the Diplomatic Corps (scroll down for the English translation) summarized the Holy Father's concerns for the state of the world for diplomats from other countries to the Vatican. Today, the Vatican published an Address to the Sixth Session of the U.N. Human Rights Council by Msgr. Silvano Tomasi, the Permanent Observer of the Holy See. Sandro Magister today highlights the Holy Father's homily for the Solemnity of the Epiphany, in an article titled The Church's Diplomacy Has a Fixed Star: That of the Magi. The homily, which preached Benedict XVI's theology of history, is provided by Magister in English translation with commentary stating that, without this homily, the Pope's address to the Diplomatic Corps "remains halting and incomprehensible." "The Human Family, a Community of Peace"
The Vatican today released Pope Benedict XVI's Message for the Celebration of the World Day of Peace 2008, titled "The Human Family, a Community of Peace." In it, he spoke about the importance of the family as the foundation of society, as the place where children learn to savor the "taste" of speech. He said, "The language of the family is a language of peace; we must always draw from it, lest we lose the 'vocabulary' of peace. In the inflation of its speech, society cannot cease to refer to that 'grammar' which all children learn from the looks and the actions of their mothers and fathers, even before they learn from their words." He spoke of the need to protect the rights of a family in society, and to provide for the basic needs of families within society. He also spoke about the environment, calling the earth "our common home." He cautioned that emerging countries, hungry for energy, should not meet those needs by harming poor countries that may be forced to sell their resources for less than what they are worth due to a lack of infrastructure. He spoke of the need for a "solid foundation of shared spiritual and ethical values" in the human family, which is increasingly unified by globalization. While he expressed that values grounded in the natural law are present in a fragmentary way in principles of humanitarian law incorporated into national and international legal authority, he added that "there is an urgent need to persevere in dialogue about these issues and to encourage the legislation of individual States to converge towards a recognition of fundamental human rights." Concerning increasing international tension and the risk it poses for the future, he expressed concern about civil wars in Africa, the situation in the Middle East, and regret for the growing number of countries involved in the arms race. Lastly, he mentioned that this year marks the 25th anniversary of the Holy See's adoption of the Charter of the Rights of the Family (1983-2008) and the 40th anniversary of the celebration of the first World Day of Peace (1968-2008). In light of those anniversaries, he invited everyone to live "a more lively sense of belonging to the one human family, and to strive to make human coexistence increasingly reflect this conviction, which is essential for the establishment of true and lasting peace. I likewise invite believers to implore tirelessly from God the great gift of peace." Yesterday, Pope Benedict XVI asked Catholics throughout the world to join in prayer for the peace conference scheduled for tomorrow in Annapolis, Maryland. His request came during his address before the midday Angelus, after concelebrating Mass with 23 new cardinals. Recalling the 60-year history of conflict between the Israelis and Palestinians, he said, "I ask you to join yourselves to the day of prayer declared today by the U.S. bishops' conference to implore the Spirit of God for peace for that region so dear to us and to give wisdom and courage to all the protagonists in this important meeting." "This call to prayer has a special timeliness this week, but the path to a just peace will be long and will stretch beyond the peace conference itself. In the weeks and months ahead may we persevere in prayer for a just peace for Israelis, Palestinians and the whole region." Today, the Vatican announced that its representative to the peace conference will be Under-Secretary for Relations with States Msgr. Pietro Parolin. Due to the short amount of time in which to select a representative and make travel arrangements, both the Vatican's Secretary of State and Under-Secretary were not able to attend, according to John L. Allen, Jr. Msgr. Parolin was appointed this afternoon to attend tomorrow's conference, and he left for Annapolis immediately. Robert Moynihan named Msgr. Parolin as one of the Top Ten People of 2006 in Inside the Vatican's January 2007 issue, calling him "one of the Church’s most tireless and effective diplomats" in recent years. Familiar with the Middle East, Msgr. Parolin was present when the Pope met with Muslim leaders on September 26, 2006, and he has previously traveled to other countries on sensitive international diplomatic missions. In today's Angelus meditation, Pope Benedict spoke about the 50th anniversary of the date when the statute creating the International Atomic Energy Agency ("IAEA") went into effect. The IAEA works for the peaceful use of nuclear technology to promote development. The Holy Father mentioned that the Vatican is a member of the United Nations organization that works for the aims of the IAEA. He also quoted section 2438 of the Catechism of the Catholic Church, which mentions the arms race and the need to mobilize resources toward "moral, cultural and economic development." This followed a meditation last week in which he voiced his support for negotiated resolutions of international conflict rather than war. Today and last week, he mentioned his predecessor Pope Benedict XV, who is known for his diplomatic efforts to achieve peace during World War I and leadership during a difficult period when Catholics fought on both sides of a war. When Benedict XVI explained his choice of name after he was elected Pope, he drew news attention when he attributed his choice to an homage to Benedict XV. After praying the Angelus, Pope Benedict pleaded for the release of 23 Koreans held hostage in Afghanistan, who are reportedly held by Taliban militants. An article is available from Asia News. Full translations are available from the Vatican, Zenit and Papa Ratzinger Forum. "The epochal changes that have taken place in the past 50 years show how, in the difficult crossroads at which humanity now finds itself, the commitment has become even more actual and urgent to encourage the non-proliferation of nuclear weapons, to promote a progressive and consensual nuclear disarmament, and to favor the peaceful and safe use of nuclear technology for authentic development, which is respectful of the environment and always mindful of the most disadvantaged populations." Pope Benedict XVI's Letter to China was posted today on the Vatican website in Chinese, English, French and Italian, together with an explanatory note and a declaration. The explanatory note and declaration provide short explanations of the Pope's reasons for writing and his basic message, possibly in recognition that reporters and others might appreciate the background information and a concise explanation of the Pope's intentions in writing. At the conclusion of the letter, he proposed May 24, the memorial of Our Lady, Help of Christians, venerated in Shanghai, as a world day of prayer in union with the Church in China, asking that "the Catholics of the whole world – in particular those who are of Chinese origin – will demonstrate their fraternal solidarity and solicitude for you, asking the Lord of history for the gift of perseverance in witness, in the certainty that your sufferings past and present for the Holy Name of Jesus and your intrepid loyalty to his Vicar on earth will be rewarded, even if at times everything can seem a failure." "By means of his Letter, which is made public today, Pope Benedict XVI wishes to express his love for the Catholic community in China and his closeness to it. "From the text of the Papal document two basic attitudes are clear: on the one hand, deep spiritual affection for all Catholics in China and cordial esteem for the Chinese people, and, on the other, an earnest appeal to the perennial principles of the Catholic tradition and the Second Vatican Council in the ecclesiological sphere. It is, therefore, a pressing invitation to charity, unity and truth. "The Letter is directed to the Church in China and deals with eminently religious questions, responding to precise queries which have been addressed for some time to the Holy See by Chinese Bishops and priests. It is not, therefore, a political document, nor, much less, an indictment of the government authorities, although it does not ignore the well-known difficulties which the Church in China must daily tackle. "The Holy Father recalls the "original plan" which Christ had for his Church and which he entrusted to the Apostles and their successors, the Bishops. In this light, he takes into consideration various problems of the Church in China which emerged during the past fifty years. From this "plan" he also draws inspiration and formulates guidelines to tackle and resolve, in a spirit of communion and truth, the said problems. "In the Letter, Benedict XVI declares himself fully available and open to a serene and constructive dialogue with the civic authorities in order to find a solution to the various problems concerning the Catholic community, and to reach the desired normalization of relations between the Holy See and the Government of the People’s Republic of China, in the certainty that Catholics, by freely professing their faith and by giving generous witness of life, contribute also, as good citizens, to the good of the Chinese people." The Explanatory Note accompanying the Pope's letter is dated May 27. It explains that the two basic thoughts of the letter are the Pope's passion for charity and his passion for truth. It then sets the letter in the context of the history of the last 50 years of the Church in China, offers a short explanation of what prompted the Pope to write this letter, and then offers summaries of the letter and its tone that are more extensive than the short declaration given above. Recognizing that the Pope's letter would attract media attention, the Vatican clearly made its best effort to avoid the risk that a mistranslation or erroneous headline might prompt an international incident in any way comparable to the misunderstanding of his lecture in Regensburg last year. While Benedict XVI's letter addresses Chinese bishops, priests, religious and the faithful with an understanding of the history and complexity of their situation, the Vatican thus also made extensive efforts to make the letter understandable to those who would not otherwise understand its context or theological and practical implications. The context includes persecutions dating back to the 1950's and government bodies that have attempted to authorize ordinations without papal consent. In the 1980's, China saw a new growth of religious freedom, new churches were built, and the faith spread. However, differences arose, ranging from clandestine ordinations of those who wanted to resist government control of the Church, to efforts by those ordained under state authority to subsequently seek to be accepted into the communion of the Church. Many of the latter were accepted in view of the complexity of the situation. Since the 1990's, Chinese Catholics have sought precise instructions from the Vatican in how to address their situation and their conflicts. Pope Benedict called a meeting held January 19-20, 2007, including the participation of some Chinese participants. At the conclusion of the meeting, he decided to prepare a letter addressing the situation. The explanation and declaration clarify that the intent of the letter is pastoral and not political. It sets out principles of Catholic ecclesiology and offers guidelines for the life of the Church in the context of the difficulties it faces in China. The role of a bishop derives from that understanding of the nature of the Church. The Pope's letter expresses hope for a dialogue leading to the eventual normalization of relations between the Chinese government and the Church, with progress toward agreement on the selection of Chinese bishops. The letter revokes all earlier directives to the Church in China. Changes in the situation there make it possible for the Chinese to follow the general canonical norms, seeking Vatican guidance when necessary. The letter itself is more than 11,000 words with 56 footnotes and a table of contents at the end. Part One discusses the factual situation facing the Chinese Catholics and the theological principles governing their situation. Part Two discusses specific pastoral problems, offering guidelines as to each of them. It is dated on the Solemnity of Pentecost, May 27, 2007. Pope Benedict went to considerable effort to emphasize his admiration for Chinese culture and to identify Chinese values that are consistent with the values of Christianity. Although not expressly mentioned in the letter, the extent of the discussion reflects the basic principle of Christian thinking that respects the cultural contexts in which Christianity exists. Pope Benedict has mentioned that in his previous theological writings, drawing from the efforts of the first and second century evangelists to present Christianity in the context of Roman culture, and the efforts of Pope/Saint Gregory the Great in the sixth century to present Christianity in England in the context of English culture (See the essay "Truth - Tolerance - Freedom" in Truth and Tolerance ). Quoting John Paul II's message from 2001, he expressed hope for overcoming misunderstandings by a dialogue leading to "concrete forms of communication and cooperation" between the Vatican and the People's Republic of China, the normalization of diplomatic relations with time and mutual good will. Likewise, therefore, the Catholic Church which is in China does not have a mission to change the structure or administration of the State; rather, her mission is to proclaim Christ to men and women, as the Saviour of the world, basing herself – in carrying out her proper apostolate – on the power of God. As I recalled in my Encyclical Deus Caritas Est, ‘‘The Church cannot and must not take upon herself the political battle to bring about the most just society possible. She cannot and must not replace the State. Yet at the same time she cannot and must not remain on the sidelines in the fight for justice. She has to play her part through rational argument and she has to reawaken the spiritual energy without which justice, which always demands sacrifice, cannot prevail and prosper. A just society must be the achievement of politics, not of the Church. Yet the promotion of justice through efforts to bring about openness of mind and will to the demands of the common good is something which concerns the Church deeply''. As you know, the profound unity which binds together the particular Churches found in China, and which likewise places them in intimate communion with all the other particular Churches throughout the world, has its roots not only in the same faith and in a common Baptism, but above all in the Eucharist and in the episcopate. Likewise, the unity of the episcopate, of which ‘‘the Roman Pontiff, as the Successor of Peter, is the perpetual and visible source and foundation'', continues down the centuries through the apostolic succession and is the foundation of the identity of the Church in every age with the Church built by Christ on Peter and on the other Apostles. Catholic doctrine teaches that the Bishop is the visible source and foundation of unity in the particular Church entrusted to his pastoral ministry. But in every particular Church, in order that she may be fully Church, there must be present the supreme authority of the Church, that is to say, the episcopal College together with its Head, the Roman Pontiff, and never apart from him. Therefore the ministry of the Successor of Peter belongs to the essence of every particular Church ‘‘from within''. Moreover, the communion of all the particular Churches in the one Catholic Church, and hence the ordered hierarchical communion of all the Bishops, successors of the Apostles, with the Successor of Peter, are a guarantee of the unity of the faith and life of all Catholics. It is therefore indispensable, for the unity of the Church in individual nations, that every Bishop should be in communion with the other Bishops, and that all should be in visible and concrete communion with the Pope. . . . The sources cited, in footnotes, in support of those principles included the Vatican II document Lumen Gentium, sections 23 and 26, and a Letter to the Bishops of the Catholic Church on some aspects of the Church understood as Communion by the Congregation for the Doctrine of the Faith during the time when Benedict XVI was its head, Communionis Notio (28 May 1992), sections 11-14. He also quoted, in a footnote, his recent Post-Synodal Apostolic Exhortation Sacramentum Caritatis (22 February 2007), 6: ‘‘The Church's faith is essentially a eucharistic faith, and it is especially nourished at the table of the Eucharist. Faith and the sacraments are two complementary aspects of ecclesial life. Awakened by the preaching of God's word, faith is nourished and grows in the grace-filled encounter with the Risen Lord which takes place in the sacraments: ‘faith is expressed in the rite, while the rite reinforces and strengthens faith.' For this reason, the Sacrament of the Altar is always at the heart of the Church's life: ‘thanks to the Eucharist, the Church is reborn ever anew!' The more lively the eucharistic faith of the People of God, the deeper is its sharing in ecclesial life in steadfast commitment to the mission entrusted by Christ to his disciples. The Church's very history bears witness to this. Every great reform has in some way been linked to the rediscovery of belief in the Lord's eucharistic presence among his people''. Before the synod on the Eucharist, the published sources for the thinking of Benedict XVI on the issues of ecclesiology and communion, and still helpful in addition to the apostolic exhortation, included Called to Communion: Understanding the Church Today and Pilgrim Fellowship of Faith: The Church as Communion . From that understanding of the nature of the Church, the Holy Father appealed for pardon and reconciliation within the Church in China, quoting his predecessor Pope John Paul II. He then called for the Church in China to live in truth and charity with the State, drawing from Scripture and the Vatican II documents concerning the proper role of Church and State and their interaction with each other. Speaking of Jesus, he said "His Kingdom does not establish its claims by force, but is established by bearing witness to and listening to the truth and it grows by the love with which Christ, lifted up on the Cross, draws people to himself (cf. Jn 12:32)'." (drawing from Vatican II's Declaration on Religious Liberty Dignitatis Humanae, section 11, and from his own General Audience of Wednesday 5 April 2006). Therefore, he concluded that an individual bishop and a legitimate national council of bishops may lead the Church under their apostolic authority, and also stated that independence, self-management and democratic administration of the Church is incompatible with Catholic doctrine. In the Church – the People of God – only the sacred ministers, duly ordained after sufficient instruction and formation, may exercise the office of ‘‘teaching, sanctifying and governing''. The lay faithful may, with a canonical mission from the Bishop, perform an ancillary ecclesial ministry of handing on the faith. On that basis, he considered the difficulty arising when State agencies made up of persons who are not ordained, and sometimes not baptized, undertake to govern the Church and to appoint bishops. Where clandestine ordinations have taken place in China, the Holy Father noted that this is not a normal condition, but rather one that exists amid suffering. He expressed a hope that those validly ordained clergy who were ordained in secret will be recognized by the civil authorities. Similarly, some bishops selected by the State and later legitimized by the Church have not always openly acknowledged their legitimization, leading to confusion among the faithful. The Holy Father stated that it is indispensable that such clergy bring their legitimization into the open with increasing signs of their full communion with the See of St. Peter. Conversely, any bishops appointed by the State who have not been legitimized by the Holy See are to be considered illegitimate although validly ordained. The Bishops Conference of an individual nation is made up of the legitimate bishops, which cannot be subject to any civil authority in matters of faith. In Part II of the letter, he considered questions related to the celebration and concelebration of the Eucharist, the remaining restrictions on religious freedom that remain despite more openness in recent years, formation of the clergy, the "new evangelization", the need for careful discernment and religious formation for aspirants to the priesthood and religious life (including "a more solid formation with regard to the human, spiritual, philosophical-theological and pastoral aspects, to be carried out in seminaries and religious institutes"), the needs of the family, the need for a serious period of catechumenate for Christian initiation of adults, and the missionary nature of the Church always and everywhere. In conclusion, the Holy Father announced May 24 as a day for prayer for the Church in China, as the memorial of Our Lady, Help of Christians, who is venerated at a Marian shrine in Shanghai. Today is the Feast of Corpus Christi (the body and blood of Christ) in the U.S. and some other countries. Some other countries, including the Vatican, observed this feast on Thursday. 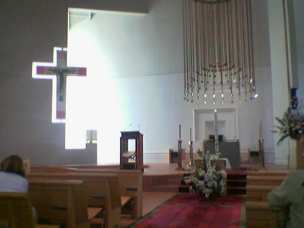 The photo here shows the tabernacle of Church of the Nativity in Rancho Santa Fe, California, beneath the crucifix, between Masses on Easter Sunday, 2006. The light surrounding it comes from a hidden window behind the cross, an architectural effect that was much more pronounced on that day than is usually the case. In today's reflection before praying the Angelus, Pope Benedict XVI mentioned the feast being celebrated today in some countries. He spoke of the intrinsic link between adoration of the Eucharist and the celebration of the Mass, referencing the discussion of Eucharistic adoration in sections 66 to 69 of the Post-synodal Apostolic Exhortation issued earlier this year, Sacramentum Caritatis. "I frequently receive, unfortunately, requests in behalf of persons, among them Catholic priests, who are held in captivity for different reasons in various parts of the world. I have them all in my heart and in my prayers, and I think today, among other cases, of those held hostage in Colombia. "I address my heartfelt appeal to the authors of these execrable acts so that they may become aware of the harm that they do and that they may return those they now hold captive to their loved ones as soon as possible. I entrust the victims to the maternal protection of the Most Blessed Mary, mother of all men." As he was speaking, news was breaking in Rome and elsewhere that an Italian priest missionary had been kidnapped in the Philippines. Father Giancarlo Bossi, kidnapped by 10 armed men this morning, is a missionary of P.I.M.E. (Pontificio Instituto Missioni Estere), the missionary organization that publishes Asia News. Asia News reports that Father Bossi's kidnappers are thought probably to be members of the Moro Islamic Liberation Front (MLF"), which has fought for the independence of Mindanao since 1978, according to an officer of the Filipino Army. The MLF has denied any involvement and has offered its assistance. Father Ragheed Ganni, who died together with 3 subdeacons one week ago in Iraq, was a friend of Asia News, which has provided extensive reporting about the situation in Iraq. CNN has coverage of the Pope's meeting with President Bush today, including an online video that runs for about 3 minutes. Asia News also has an article posted. During the meeting, they discussed the president's meetings at the G8 summit that concluded yesterday. During the televised portion of the meeting, Bush mentioned the U.S. plan to increase contributions to fight AIDS and other diseases in Africa. During the summit, 6 nations, including the U.S., agreed to commit a total of $60 billion for that purpose. However, activists have objected that a commitment to spend $25 billion for that purpose by 2010 was already made 2 years ago, and only $2.3 billion of that sum has ever been delivered. Delivery of increased funds will thus mark a significant achievement in international cooperation. On June 1, the bishops of 7 leading countries, including all of the G8 countries except Italy, signed a letter to the G8 leaders calling for their attention to the poverty in Africa, as then reported by Zenit. At the conclusion of Wednesday's general audience, the Pope also appealed to the G8 leaders for development aid to poor countries, especially Africa. The Pope mentioned educational assistance in particular, mentioning a previous commitment of leading nations to provide for an elementary school education for all children by 2015. Catholic Relief Services has significant ongoing work in the continent of Africa, and African bishops have had recent ad limina visits to the Vatican, drawing additional attention to the situation in their countries. The Pope's prayer intentions for June specifically mention the Church in northern Africa. As expected, the Pope raised the issue of the situation facing Christians in Iraq. Recent kidnappings and the recent killing of a Chaldean priest and his subdeacons in Iraq have drawn particular attention to the persecution of Christians in Iraq. Asia News has a dossier of articles on the Church in Iraq. In addition, Sandro Magister has featured articles about the Iraqi Church in his recent online reporting at www.chiesa. The Patriarch for the Chaldeans, Emmanuel III Delly, recently appealed for an end to the persecution, placing blame on both internal conflicts among Iraqis who are each fighting for their own personal interests, and external forces including the U.S. troops in particular. He stated, "External persecution is that which has affected the very dignity of all the Iraqi people, whose mosques, churches and institutions have been destroyed or occupied, without any respect for their faith." He mentioned the Baghdad facility of Babel College, a Catholic school that was taken over for use by U.S. troops without consent and without compensation. Iraqi Christians reacted to the unusual statement by the patriarch with hope, saying that they were finally doing something other than waiting in silence for Christianity to be driven out of Iraq or destroyed. The Vatican issued a statement following their meeting mentioning the subjects discussed, which also included the Israeli-Palestinian question, Lebanon, Latin America, human rights and religious freedom, the defense and promotion of life, marriage and family, the education of the young, and sustainable development.